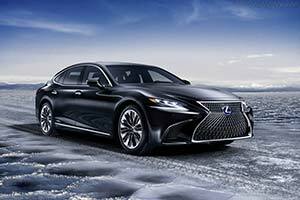 The 2018 Lexus LS 500h, the full hybrid version of Lexus' new flagship sedan, was unveiled today in Geneva. The car's design successfully brings together the virtues of a long-wheelbase four-door sedan with a low, coupe-like profile, positioning the LS perfectly across the growing sedan and coupe segments. The cabin has benefited from an equally new approach, focusing on "progressive comfort," interpreting Japanese aesthetics and craftsmanship traditions in the context of an advanced, luxurious and innovative vehicle interior such as the unique door trim ornamentation. Notably, the LS 500 was honored at the NAIAS with the EyesOn Design Award for Design Excellence - Interior Design. Conceived as the new global pinnacle of the Lexus brand, the LS goes beyond what the world expects from a luxury car. Chief Engineer Toshio Asahi explained: "Developing such a flagship model required a massive paradigm shift. Rather than being bound by the conventions that had defined luxury cars in the past, we aimed to create a car with innovative, emotional and sensual appeal that would draw customers' eyes away from other luxury cars and provide entirely new values." The LS 500h is built on the new Lexus Global Architecture - Luxury (GA-L) platform, which is shared with the all-new LC. This platform ensures a low center of gravity and optimum weight distribution, contributing to the car's essential stability and handling agility, which in turn deliver increased driver rewards. The fundamental high rigidity of the chassis allows the new multi-link suspension to be tuned to achieve enhanced handling performance and the supreme comfort for which the LS is renowned. The car's dynamic performance also benefits from the coordination of braking, steering and stability systems through Lexus Dynamic Handling. Advanced technologies are further used to deliver impressive safety performance. The LS 500h's available Advanced Safety Package features the world's first Intuitive Pedestrian Detection system with Active Steering within the lane. Omotenashi, expressing the unique sense of Japanese hospitality, defines the LS 500h's whisper-quiet and luxurious interior. Supreme comfort is provided by front and rear seats with multiple power adjustment, heating, cooling, and massage functions. There is also an optional rear seat arrangement that includes an extending leg ottoman and the most generous leg room of any LS generation. At 123 inches, the wheelbase of the new LS is in fact 1.3-inches longer than on the current long wheelbase LS 600h L.
Lexus Takumi craftsmanship also contributes to the special quality of the LS 500h's cabin, in luxurious new trims, materials and detailing, including a new pleating treatment and Kiriko glasswork on the inner door panels.